Heat oven to 350°F. Lightly spray 12-cup fluted tube cake pan with cooking spray. 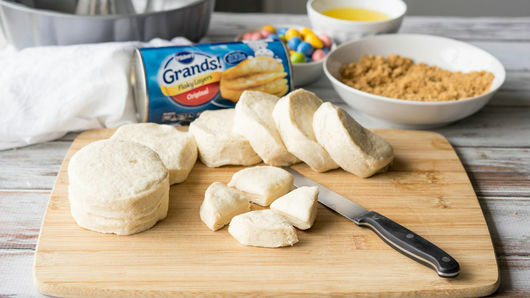 Separate 2 cans (16.3 oz each) Pillsbury™ Grands!™ Flaky Layers refrigerated original biscuits into 16 biscuits. Cut each biscuit into 4 equal pieces; press out each piece until flat. In small bowl, stir together 1 cup packed brown sugar and 1 teaspoon ground cinnamon. Cut 4 oz cream cheese (half of 8-oz package) into 48 small pieces. Roll each piece of cream cheese in brown sugar mixture; place 1 piece in center of 48 flattened biscuits. 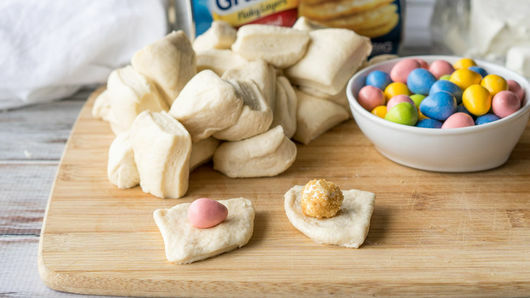 Place 1 pastel candy-coated chocolate eggs in center of each of the remaining 16 flattened biscuits. Pull up sides of each flattened biscuit; pinch seams to seal. 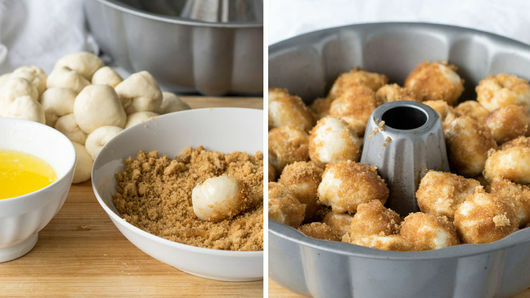 Dip each dough ball in 1/2 cup melted butter; roll around in remaining brown sugar mixture. Layer coated dough balls in pan, scattering chocolate egg-filled ones throughout. Bake 35 to 40 minutes or until golden brown. Cool in pan 10 minutes. Place heatproof plate upside down over pan; turn plate and pan over. Remove pan. In small bowl, beat 1 cup powdered sugar with 1 tablespoon water with whisk until smooth. Drizzle icing over slightly cooled monkey bread. 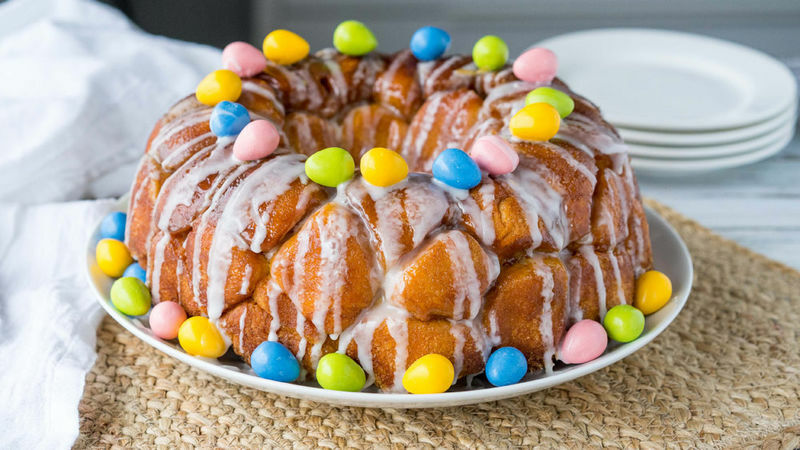 Decorate top with additional pastel candy-coated chocolate eggs. To make the icing creamier, mix with 1 tablespoon whipping cream instead of water. You can substitute chocolate-covered peanut butter eggs for the pastel candy-coated chocolate eggs.